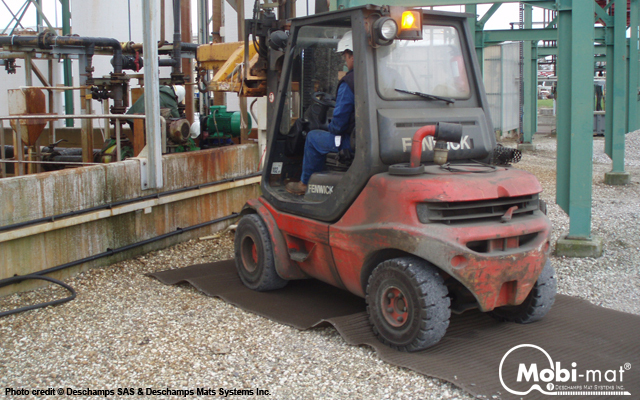 Maintenance Access Surfacing - Mobi-Mat by DMS Inc.
Mobi-mat® Vehicle Mobility Mats™ portable roll-out access mats are designed to be rapidly deployed for quick maintenance access or in case of an emergency. The Mobi-mat® VMM™ rolls are compact, lightweight and easily transported and stored after use. Mobi-mat® portable rollout mats are lightweight, made of recycled polyester, nonslip and durable. This patented 3-D recycled polyester Mobi-Mat® Portable Vehicle Mobility Mat is an ideal surfacing for covering gravel and dirty ground surfaces for allowing easy and quick access of various maintenance wheeled vehicles, to create an anti-slip vehicle pathway or visible temporary sidewalks to divert pedestrian around worksites in minutes. 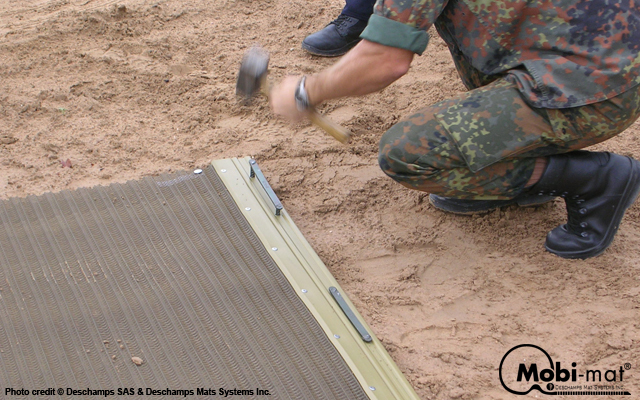 Thanks to its high mechanical resistance and anti-slip properties, the Mobi-Mat® Vehicle Mobility Mat brings grip to wheeled vehicle tires and prevents rutting and bogging down of vehicles. Mobi-Mat® surfacing roll is easily laid on the ground and anchored with staples.